The state of Pennsylvania has just found themselves a loophole they are going to use to take guns from law-abiding citizens. It is entirely legal in the state of Pennsylvania to use and possess marijuana so long as the user has a valid issued patient Medical Marijuana Card. Also, there is no law in Pennsylvania that states medical marijuana patients have to turn in their guns. 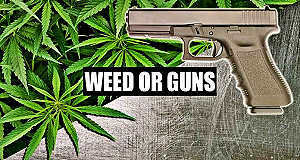 However, the Pennsylvania State Police (PSP) care not about state laws and have issued a statement demanding anyone with a Medical Marijuana Card turn in their guns – or you are in violation of the law – therefore you will be arrested. While the state of Pennsylvania has no law on the books that forces legal marijuana patients to turn in their guns, the state police are ignoring state’s rights and doubling down on the tyrannical federal law. This week, the PSP issued a statement on their website informing all medical marijuana patients that refusing to turn in their guns makes them criminals. The following is excerpted from CBD: A Patient’s Guide to Medicinal Cannabis by Leonard Leinow and Juliana Birnbaum, published by North Atlantic Books. Overdose deaths in the United States involving opioids (prescription pain-killers and heroin) have quadrupled since 1999. Estimates of the medical costs involved are over $72 billion each year in the United States alone. Dr. Donald Abrams, chief of the Hematology-Oncology Division at San Francisco General Hospital, is among many medical professionals pointing out that anything that weakens this epidemic, which kills eighty Americans every day, is worthy of consideration. CBD and other cannabis-based medicines have the potential to be a major tool in the battle against the current epidemic of pharmaceutical drug abuse and overdose in the United States. They have been used successfully as a substitute for opioid-based pharmaceuticals for pain relief, allowing people to lower their dosages and preventing addiction. Cannabis and narcotic painkillers are known as co-agonists, which means that each of them magnifies the effect of the other. This allows people to take lower doses with comparable effectiveness. One recent research study of 300 people using high doses of opioids to control pain found they could reduce their opioid intake by 60 percent within a three week period of taking CBD and still manage their pain at the same level. After two months, many of them were able to get off the opioid medicine altogether. CBD has also been used successfully to ease symptoms from opiate withdrawal during the addiction recovery process. It also decreases the physical craving for the opiates. It has been said in the past that cannabis is a gateway drug. In reality, it is a gateway in the other direction, a gateway out of addiction. It is a drug that is used to facilitate the healing of people addicted to hard drugs. As reported in 2015, the sales of pharmaceutical opioid drugs have dropped by 5 percent in states that have legalized cannabis. The relationship between the passing of a medical marijuana bill and the decrease in opioid overdose deaths has strengthened over time. During the first year after a state’s law was implemented, deaths decreased by nearly 20 percent and continued to steadily drop. Five years after implementation, the rate was 33.7 percent lower. Why Is the World Legalizing Marijuana All at the Same Time? This November, California residents will vote on, and undoubtedly pass Proposition 64 (2016) The California Marijuana Legalization Initiative (#15-0103) also known as the “Adult Use of Marijuana Act.” The fear from police who stand to lose their cash cow from smash-and-grab raids on marijuana dispensaries and extraction companies has sent them into a fury. Over the last year, California cops have ramped up asset seizures of cannabis companies in an apparent response to Prop 64. A detailed report by Inc.com has explained how one of these companies is being affected by these raids. At 7:37 a.m. on January 28, 2016, nearly 30 officers from the San Diego Joint Narcotics Task Force conducted a raid on Med-West Distributors, a licensed medical cannabis extraction company. The officers, decked out in helmets, tactical gear and clutching assault rifles and handguns, used a sledge hammer to open the door and burst into the lobby. Once inside, the task force arrested two employees present, cracked open the company’s safe and collected its inventory–over 30,000 cartridges of cannabis oil and a couple pounds of concentrate. The Narcotics Task Force seized $1.4 million in cash, product, and money from various bank accounts belonging to owner James Slatic ($325,570 in cash was found in the safe). Med-West had been providing hundreds of licensed dispensaries around California with medical CO2-extracted cannabis oil and products under the state’s medical marijuana laws since 2010. The company was licensed by the city of San Diego and operating openly. Slatic says his company was raided a second time in late June and is now officially closed. Not only did law enforcement officials rob Slatic’s business blind and effectively bankrupt him, they hit his innocent family, too. Using federal asset forfeiture laws, San Diego law enforcement has seized all the company’s accounts and the money in Slatic’s personal account. They have also seized the bank account of Slatic’s wife, who is a federal employee at the Veteran Affairs. But it gets worse. After seizing his and his wife’s personal assets, this thieving group of public servants then went after his kids’ college savings accounts. His children can no longer pay for college. Slatic, who’s had his life ruined by these people has yet to be charged with a crime.